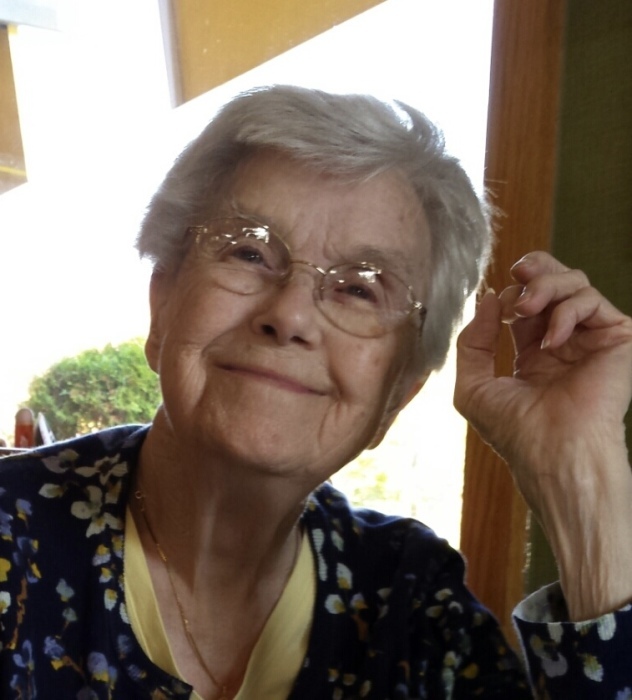 Obituary for Anita B. Campbell | Brewer Funeral Home, Inc.
Anita B. Campbell, 93, of Indian Lake, passed away peacefully on Saturday, Jan. 26, 2019. Born March 22, 1925, in Hillburn, she was the daughter of Charles and Ammie Banker. Anita graduated from Suffern High School in 1942, and in 1947 married Robert “Bob” Campbell. Together, Anita and Bob raised two daughters, and owned and operated a paint and wallpaper store. She loved to sing as a member of the Rockland County Choral Society. She volunteered as an election worker in Rockland County, and later at the Indian Lake Public Library. Anita loved the mountains and lakes of the Adirondacks where her family vacationed and camped, and eventually built their own camp, on Lake Abanakee. The camp became home when Anita and her husband retired in the early 1980s. Anita was an accomplished needleworker and knitter; she was an avid reader and a whiz at crosswords. She was also a lover of animal, plants, and all things in the natural world. She raised huskies and German shepherds, and had an amazing green thumb, tending to many beautiful African violets. She spent much time in the woods and paddling on Adirondack lakes. Anita was more comfortable in blue jeans than dresses, and did not shy from the labor required to live in the woods. Anita was devoted to her family. She was a patient teacher, and loved sharing her many talents with her grandchildren. In addition to her parents, Anita was predeceased by her husband, and her brothers, Charles and Richard Banker. She will be remembered by her daughters Sue Naku, and her husband Klaus, of Raleigh, N.C; and Jan Nahm, and her husband Rob of Ventura, Calif. She was the loving grandmother to six grandchildren, Kris (Dan) Nusskern, Peter (Alice) Naku, Katie (Rob) Chernak, Heather Padgett, Allison (Shane) Nahm-Mallen, and Bobbie Nahm; and great-grandmother to Bear and Ammie Nusskern; Paige, Ryan and Gavin Naku; and Molly and Alyssa Chernak. She will also be fondly remembered by her nephew John (Carol) Banker; and nieces Dannie Alderson, and Pat Banker (Art Cote). A graveside service will take place in the spring at the Cedar River Cemetery in Indian Lake. Those who wish may make a donation in Anita’s memory to Dementia Alliance of North Carolina, 9131 Anson Way, Suite 206, Raleigh, NC 27615; or Transitions LifeCare, 250 Hospice Circle, Raleigh, NC 27607.